If the mirror cover of the vanity mirror is folded up when the vehicle is in motion, you could be blinded by incident light. There is a risk of an accident. Always keep the mirror cover folded down while driving. 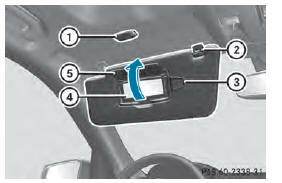 Mirror light 1 only functions if the sun visor is clipped into bracket 2 and mirror cover 5 has been folded up. ■ Fold down sun visor 1. ■ Pull sun visor 1 out of retainer 3. ■ Swing sun visor 1 to the side. ■ Slide sun visor 1 horizontally as required. 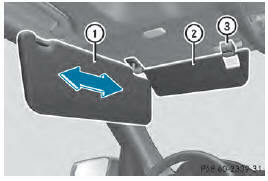 ■ Fold down additional sun visor 2 to the windshield.